A special treat today! Amy of THE B-LINE has kindly agreed to share the making of one of my personal faves... the Paloma Bracelet. I never know when inspiration will strike, so I always carry around a sketchbook to record my ideas. I usually have more ideas than I know what to do with, but if I’m having one of my less creative moments, I’ll crack open my sketchbook, my closet, a magazine, or a book for inspiration. With my concept in mind, I sort through my huge container of polymer clay, playing with color combinations or blending clays to reach the color I want. 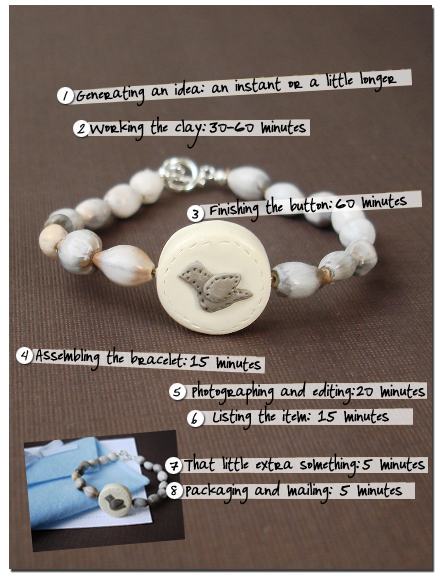 For the paloma bracelet, I shape the circular “button”, which I then decorate with “stitch marks” using a wooden stick. I shape the dove by hand and affix it to the button, using stitch marks to give it that final touch. Once the clay piece looks just right, I bake it for about 30 minutes. After the clay has cooled, I sand or file it, if necessary, to remove any rough spots. I then seal it with a satin varnish. As the varnish dries, I sort through my stash and choose beads for look that I am trying to achieve. I then assemble the bracelet. I try to get outside in mid-morning if possible, since that’s when the light is best in my backyard, where I like to take photographs. I’ll usually spend no more than 10 minutes photographing each piece and then another 10 minutes editing shots to be used for posting. I take about 5 minutes to write a description for a piece and another 10 minutes to complete a listing on etsy. I want each of my customers to feel like they are treating themselves to something special when they shop at the b-line, so I ship all of my pieces in a handmade blue felt pouch. Cutting the felt and ribbon, sewing the pouch, and trimming all the strings takes me about 5 minutes per pouch. Hot dog! I love selling things! When an order comes in, I pull the piece from my inventory, bundle it up in a felt pouch, and write a thank you note to the buyer. I then place everything in a padded shipping envelope and weigh it on my printer scale so I can print the correct postage and the shipping label. Then it’s out the door to my incredibly friendly mail carrier the next morning! So lovely! What a lot of love that goes into each and every piece. It would truly be "something special" to receive a gift like this.